I don’t want to be one of those people who talks about all the things they’re going to do someday, but never actually does them. And neither does my husband. So, we go after the things we want hard, and we don’t allow ourselves to be intimidated by the size of our goals. Since big goals often come with big price tags, we’ve gotten to be good savers. 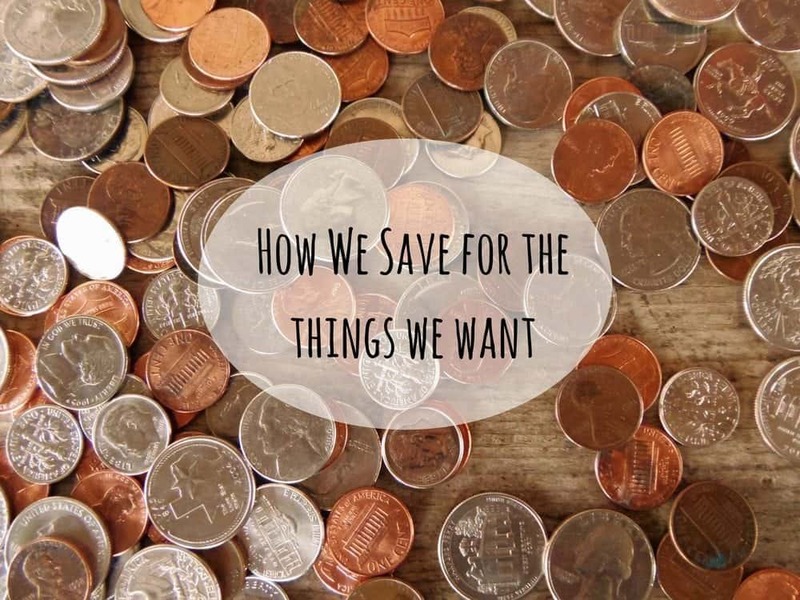 Here’s how we plan and save for the things we want. We turn dreams into goals and goals into plans. 16 years ago, if we’d just said we’d like to own a cabin someday, and left it at that, we’d probably still be saying that today. Instead, we set that as a goal for ourselves, and started planning how we were going to make it happen. This got us over the hurdle of starting, and turned it into something we were actually working towards. We find ways to work on our goals, even when we don’t have much money. When we first started working towards our goal of owning a cabin, we were a long way off from having the money to go out and buy a big parcel of land, but we still found ways to work towards our goal. We drove around on the weekends and looked at property to better define what we were looking for, and we put together a list of the things we would need once we finally had our cabin, so we could start looking for these things we were out yard saling, thrift storing and curb shopping, It may sound like a small thing, but seeing all of those second-hand finds pile up in the basement made our goal seem more real to us, and reminded us that we were making progress – even if things weren’t moving as quickly as we wanted. We find ways to cut the cost of our goals. This gets us to the finish line faster, and allows us to accomplish more than our budget would otherwise allow. When we bought 35 acres and announced our plans to fix up the cabin that sat on the property, plenty of people thought we were nuts, and it wasn’t hard to see why. The cabin was an absolute wreck. It only had three sides; it was missing part of its roof; and all of the windows had been busted out of it. But because it was in such bad shape, it wasn’t deemed to have any value. So, we paid for the land, and got a free cabin in the deal. And you know what? It took a lot less time and money to fix up that wreck of a cabin than it would have to build a new one from scratch. Within a week of purchasing the property, we had a place we could stay, while we completed the rest of the work. Had we not gone this route, we’d probably still be saving up to build. We don’t allow our plans to get derailed. If you want to make big things happen, you’ve got to be willing to move mountains. So, when obstacles get in our way, we find a way around them. I don’t think there’s ever been a time where we’ve set a goal and met it without running into a bunch of road blocks. We don’t just save for the fun stuff. To ensure we reach our goals, we’re careful to save for all the things that could throw a wrench in our plans. That means paying attention to the age of our roof, our HVAC system, our cars and anything else that might need to be replaced in the immediate future, so we can save for those things before they become a problem. It also means having an emergency fund in place to cover the expenses that truly catch us by surprise. We save for multiple goals at once, but we don’t try to save for everything at once. At any given time, we’re saving for several short, medium and long-term goals, but we only have so much time and money to work with, so we try to be realistic about what we can accomplish. This makes it essential for us to prioritize goals, so we go after the stuff that’s most important to us first. Right now our small goals include painting the office, planting some holly bushes and purchasing a few office furnishings. Since these are relatively low-cost goals, we usually raise the necessary funds by having a yard sale or doing some other side hustle. 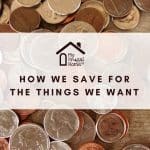 This keeps these expenses from taking away from our household budget or our other savings goals. A few years ago when we needed to purchase a chainsaw, I earned the money by testing websites. It was fun work, and it got us what we wanted. For us, this includes things like saving for a vacation, a new car or a home improvement project. It’s the stuff that we need to start planning for now to ensure the money will be there when we need it. And we’ve found the best way to tackle these sorts of goals is to automate our savings. So, when we set a new medium-sized goal for ourselves, we open a new savings account for that goal, and we set it up to automatically pull money from our checking account on a weekly or monthly basis. We intentionally make this money hard to access by putting it in a different bank than the one we use for our day-to-day banking. We use Capital One 360 for this purpose. They allow you to name your accounts, so we have an account called “vacation,” another called “emergency fund,” etc. This helps to keep our goals organized, but it also makes us think twice about robbing money from one of those accounts for another purpose. These are all of those long-term goals that’ll move us closer to financial independence and the lifestyle that we want to live. Right now it includes things like paying off our mortgage and saving for retirement. In the past, it’s also included stuff like saving for the cabin and our office. If a goal involves paying something off, we set a target date, and then calculate how much we’ll need to pay each month to reach it. This amount then becomes a part of our budget, and we treat it like any other bill. If a goal involves saving for something down the road, we treat it just like our medium-sized goals, which means setting up a separate savings account with automatic withdraws from our checking account. Any unexpected money that comes our way gets applied to these big goals. Don’t be one of those people who talks about things you’ll never do; be one of those people who actually does them. Find a way to start working on your goals, and keep working on them until you achieve them. Love this article! That is exactly how we save too! The only difference is that some funds stay home with us…smaller funds and emergency funds so we have some money if we need it on the spot. I love this! I also use Capital One 360 for my savings and have money transferred weekly and bi-monthly into different accounts. Reading this over coffee this morning has inspired me to reevaluate my spending vs saving and set goals for each of my accounts. Thank you for the information, the inspiration and for everything you share!